Oh, my friends. 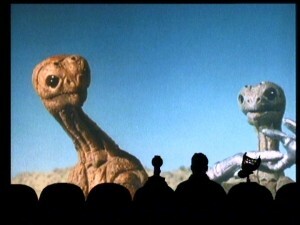 Let me tell you about one of the greatest shows every produced in the history of mankind: Mystery Science Theater 3000. “Mystery Science Theater 3000” is a mouthful, so it’s often shortened to mst3k, or even “misty” due to the fact that even mst3k is a bit of a mouthful, and misty is what it sounds like when you say “m-s-t” really fast. There was a guy named Joel, Not too different from you or me. He worked at Gizmonic Institute, Just another face in a red jumpsuit. But his bosses didn’t like him, so they shot him into space. We’ll send him cheesy movies, The worst we can find (la-la-la). He’ll have to sit and watch them all, And we’ll monitor his mind (la-la-la). Because he used those special parts To make his robot friends. Long story short, it was a great show and I’m feeling all sad and nostalgic just thinking about it. Pingback: Mystery Science Theater 3000: The Return | Is this thing on?